Successfully Added 720P HD In-Car DVR with 2.5 Inch LCD Display and Night Vision (H.264 Video Compression) to your Shopping Cart. 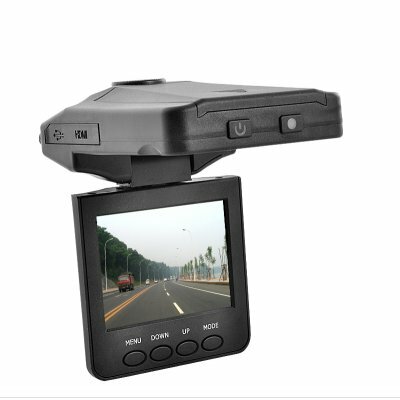 Keep yourself protected from fraudulent lawsuits on the road, or simply capture video of the beautiful scenes on the way, with one of the most advanced car DVRs ever. Recording 720P HD videos with H.264 compression, this is your ideal choice for an in-car DVR. Heading on a road trip with your family or friends? Simply mount this mini DVR on your windshield and catch what you see on the road: breathtaking views, interesting events, etc. Supporting SD card up to 32G, it lets you record hours of high quality videos. Best of all, with the powerful night vision functionality, this is one DVR that works all day and all night. There are tons of other cool features that make using this in-car DVR a pleasant experience. With cycled recording, you can keep the DVR working for hours without changing the SD card; the 2.5 inch screen is 270 degree rotatable allowing you to keep an eye on the video captured while driving; and with the DVR’s compact pocket size, you can even use it as a portable DVR for capturing videos anywhere while you need it. Easy to set up: simply hook up to the mounting plate, attach it to the windshield and you are ready to go. With this product, if a car accident happens, you will have a clear and detailed video that you can proudly present in your defense and put the blame on the bad guy.